Used trucks can be an economical solution to your business needs, but there are some common problems that used trucks can present that you should know about if you’re buying a truck from an unreliable source. Understanding these common issues will prevent costly repairs, enhance the safety of drivers, and help you know what to do to avoid any disruption to your work. It’s important to understand what to look for when purchasing a used truck. Obtaining any and all maintenance records from a truck’s previous owner will provide you with the information you need to address common problems. Rusting underneath a roof will be indicated by raised spots. Additionally, the bottoms of the truck’s doors can develop rusting and should be assessed thoroughly. The truck’s tires can also be examined to determine if any brake fluid leakage has occurred, or if there is wear to the tire’s tread. Used trucks often present problems related to damaged or worn seals. Coupled with fuel line and exhaust problems, this can lead to costly and disruptive damage while on the road. Unfortunately, these kinds of issues aren’t easily detected upon the first inspection. This can cause your truck to break down while on the road. Transmission issues are also commonly seen in used trucks. Repairs related to your truck’s transmission system can be some of the most expensive ones you’ll have to face as it requires extensive repairs that include a disassembly of the transmission in order to properly fix it. If a used truck has a faulty transmission, it’s recommended to avoid purchasing it to prevent future problems on the road. Many of these common problems found in used trucks can be avoided if you know what to look for when purchasing or leasing your vehicle. When searching for a new truck, it’s important to allow yourself the time to fully research all of your options. You need to examine the physical condition and performance of a vehicle to ensure that it will meet your needs. In addition to checking the physical components for damage or wear, you should check the vehicle’s fluids, air filters, and engine. Testing kits are available to determine the quality of the truck’s fluids and air filters should be free of excess dirt and debris. When examining the engine, look for any oil or grease deposits as well as any signs of recent maintenance or repair. These include new gaskets and other components. The engine should start easily and without any unusual noises, which can indicate issues related to the connecting-rod bearing or crankshaft. There are a number of common problems with used trucks that can lead to unwanted and costly repairs down the line. Knowing what to look for will ensure that your truck provides a long performance life for you and your business. 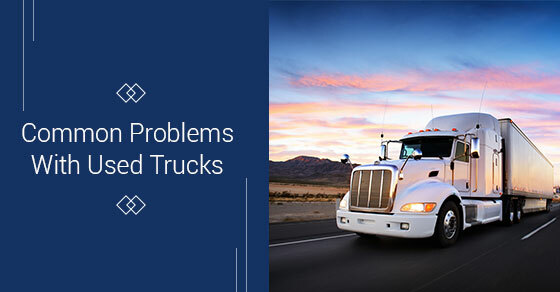 To avoid the possibility of these issues altogether, contact Truck Loan center today. We’re happy to help guide our clients towards choosing an option that will perform the same way it did when it first drove off the lot.